Our large and impressive balloon decorations fill any space with delight. Your guests will be enchanted with the transformative power of great balloon decorations. We will consult with you to find the perfect package for your theme, color scheme and venue. Nothing screams "Fun!" 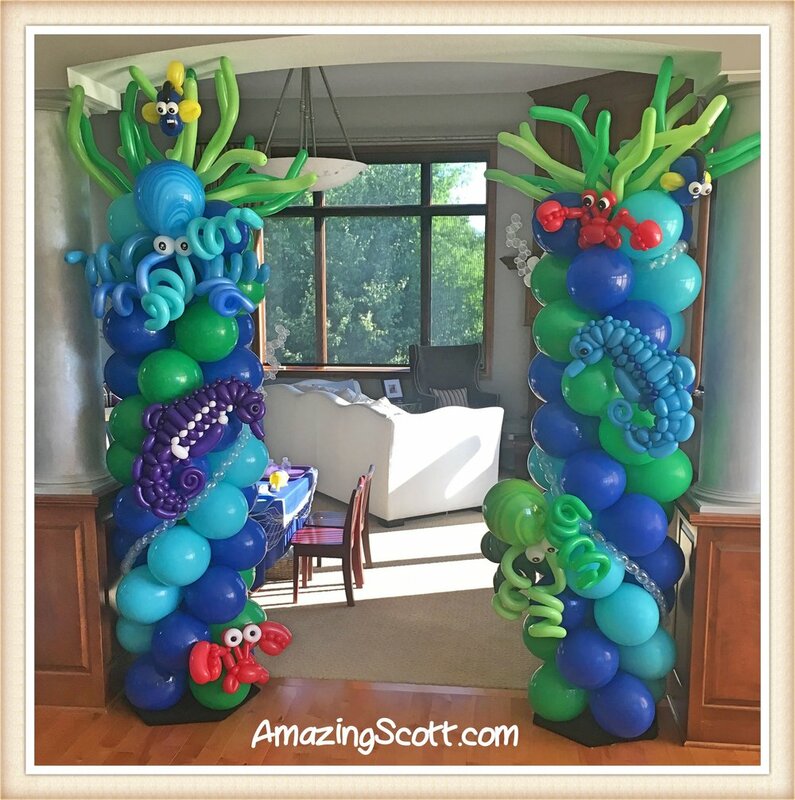 like a balloon arch...the ultimate in interactive decor! Your guests will feel special making a grand entrance into your event through one of our magical arches. Arches aren't just for doorways! They make a great addition to marathons, fairs, conventions, dance floors, stages, photo opportunities, grand openings, parades, bars, pool (check our dragon in the gallery! ), really anywhere! Our columns make a considerable impact in any space. They can be used in pairs to flank a doorway or in larger numbers to create the effect of rooms within your space. One of the most versatile of classic balloon elements, columns can be used on dance floors, starting lines, stages, and SO much more! We will consult with you to customize your columns to your theme and color scheme. Together we will create a unique piece of art that will transform your space. A photo frame brings your guests into the magical balloon world themselves and encourages them to permanently memorialize your event in photo books and on social media. No need for a booth or a photographer, your event attendees already have a camera on their pocket (their cell phone!) and they'll be sure to spread the word in their social media. You never have to tell your guests to say cheese because you know they’ll already be smiling! Whether you're planning a graduation party, a Hawaiian luau, or a baby shower for family and friends, our themed party balloons, balloon decorations, and helium balloons give you everything you need for a lighter-than-air celebration.